This report is available to subscribers of the Chilmark Advisory Service or may be purchased separately by clicking below. To accompany the release of this report, lead author Brian Murphy will be hosting a webinar in which he will share some of the key findings of this report and answer questions about the trends in analytics that are driving modern changes to healthcare delivery. Our extensive research for this report uncovered a market wherein today’s leading analytics applications are beginning to address broader needs than just VBC. This is causing greater separation in the relative capabilities of vendor solutions in the market today, with some vendors still primarily focused on VBC and care management needs, while others move to address EPM. 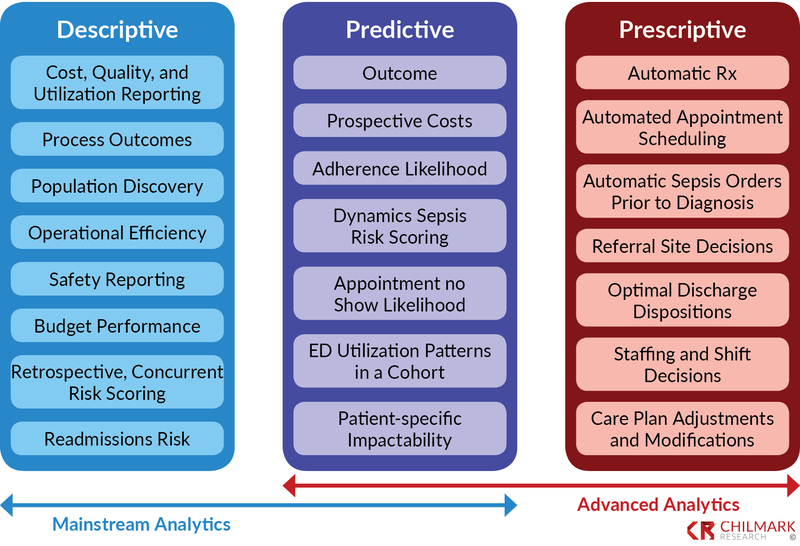 This report characterizes current analytic solutions as either “mainstream” or “advanced.” Most HCOs have experience with mainstream analytics – applications that characterize and summarize current performance. 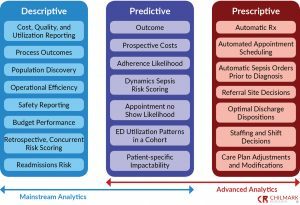 While the underlying technology and general approach is well-established, mainstream analytics has yet to supply a robust predictive insight and prescriptive guidance; for that, HCOs are looking at advanced analytics. Market Vision, Extensibility and Engagement, Complimentary Services, Market Momentum. Vendors Profiled: Allscripts, Arcadia.io, athenahealth, CareEvolution, Cerner, Change Healthcare, eClinicalWorks, Epic, Forward Health Group, Health Catalyst, HealthEC, IBM Watson Health, Innovaccer, Lightbeam, MedeAnalytics, Medecision, MEDITECH, NextGen, Optum, Philips, SCIO Health Analytics, SpectraMedix, and SPH Analytics. To learn more about this report, please contact John Moore with any questions.